Why Don't People Back Up? - Ask Leo! Backups are one of the ways people can protect themselves from everything from hardware failure to virus infections. So why don't people back up? It’s a common topic here on Ask Leo! for a good reason. Not a day goes by that I don’t see somebody suffering for lack of a backup. Not a day goes by that I don’t see somebody who could have avoided a serious problem simply by having taken a backup. It’s tempting to think people are being lazy, but I believe that that’s quite unfair. As I mentioned in another commentary, people just expect computers to work. Unfortunately, as we see over and over, it’s frequently not true; it’s just not a realistic expectation. Let’s face it. Those of us who’ve used computers for any length of time know better. Not because we’re any smarter, but because, in all likelihood, we’ve experienced a catastrophic data loss at some point or another. We know better because we’ve been burned. Unfortunately, it’s not until we’ve seen or had that gut-wrenching experience that we begin to realize the inconvenience of setting up a backup solution pales in comparison to the inconvenience of the data loss it could have prevented. All of a sudden, that backup doesn’t look like such a bad idea. So how do we prevent the average user or first time user from ever having to go through that experience? How do we convince more people to some how back up their data? I honestly think that this is one of those cases where there is no substitute for living through that painful experience. All we can do is be ready with solutions so that it doesn’t have to happen again. In an ideal world, none of us would have to consider backing up. In a truly ideal world, data would never be lost, hardware would never fail, and we’d never accidentally permanently delete something we’d need later. Needless to say, we don’t live in that ideal world. But I think there might be an opportunity to make things better. The fundamental problem here is that users have to recognize the issue and then separately, proactively, take preventative action. What if they didn’t have to? What if, as part of setting up every machine, installing the operating system simply included a true, full-featured backup solution, instead of the typically crippled, hard-to-use applications that are so often there? What if, like choosing a password, you couldn’t even complete initial setup without having done something to address the risk of data loss – something better than enabling a Recycle Bin and something more complete and robust than Window’s System Restore. What if every machine came with a back-up hard drive or a free online back-up service? I have to acknowledge that the Mac’s Time Machine is pretty close. It still takes initiative, and apparently a second hard disk, to set it up, but it’s a step in the right direction. I know I get repetitive and somewhat annoying about backing up from time to time here on Ask Leo!, but believe me, it’s with cause. Not only have I myself experienced data loss, I’ve also experienced my back-up plans saving my bacon on multiple occasions. If you saw how often I see people needlessly lose important data, I think you’d understand as well: this is a much larger issue than most people think. What solution do you use? What should the average user do? Let’s Get More People to Back Up - Nothing can prevent or side-step issues like properly configured backups. In this overview I want to encourage more people to back up. You can help. If I Use a Cloud Sync Program to Back Up, Won’t Accidental Deletions Delete the Backup? - Backing up to auto-syncing cloud services is very convenient. But what happens when it syncs your mistake? « Previous post: Does Windows Support Drives Larger than Two Terabytes? Well, Mary, you’re absolutely correct. I haven’t read ALL the comments yet, but I suspect yours is among the best and most important. I was fortunate. I had the good luck of being introduced to all the terms you mentioned at my workplace. However, since the file storage strategies involved aren’t things I think about every day, I sometimes need to step back and double-check before really understanding. In fact, as I’m now contemplating use of a new backup strategy, the questions you raised about mirroring and striping, etc., are very important issues pertaining to the new backup server equipment I intend to purchase. I don’t think the answers to those questions can easily be answered within the space that a comment allows, but if you’d be a little more patient and investigate the meaning of the various RAID strategies, I think the fog may suddenly clear and many more things will suddenly make better sense. I know the answers are out there, but it’s a matter of finding the right place offering the easiest-to-understand explanations. here’s my best practice yet. i set up my computer in the first place with an external hard drive stuck to the roof of the notebook with velcro dots. all my applications are configured to use the external drive for data, so all documents, emails, spreadsheets, everything is on the external drive. i back up the external drive twice, once to the internal hard drive and once to a second external drive. then any time my computer goes down i don’t lose any data at all. when i need to transfer to a new computer its easy, all i do is install all the apps in the same way to use the external drive for data, don’t have to transfer any data from the old machine. typically it takes three working days to service computer problems. in the meanwhile i can use another computer to access my data. one time it took a month to repair the computer because they had to send it away to their service centre then had to import the part needed from japan. fortunately that time i still had an old computer i could use and just carried on with some inconvenience but without any loss of data. Thanks, Clare. Good, good idea. Mary, you hit the nail on the head for me. I don’t back up because the terminology is abstruse, seemingly because the writers aren’t aware of anyone’s needs but their own. Not every computer user is a geek, just as not every driver is a mechanic. I wish it was as simple as choosing the KINDS of things we want to back up (a checklist) so a decent back-up program could simply do it. Period. Other questions I have about backup are how does one actually recover after the crash and does the backup actually get you back to the original condition quickly and easily? Also how much time and energy is required in starting an maintaining the backup process? If you look at this video series: Backup and Restore with Macrium Reflect 5.0 – it’ll show you exactly what a restore looks like and how you set up for that in the first place. A restore is basically booting from a rescue disk, running your backup program from that disk, and telling to “take that backup I made over there and put it on the machine over here”. Maybe confusion is part of problem people don’t backup. Acronis website say it will backup emails, photos, music, entire operating system, ect. It not say you need extra hard drive. So if computer have 250GB hard drive, and 200GB is used up, how can 200GB be stored in 50GB free space? People might say can’t afford cost of program plus cost for extra hard drive so program useless. NO WAY do you want your Backup to be on the same hard drive as what you are backing up. The most failing device in your computer IS the hard drive ! When it fails, your “Backup” is GONE too. Way best is an external USB hard drive to store your backups. And, Ben, the whole point of a backup is to have a copy _somewhere_else_. Making a “backup” of the contents of a disk onto the same disk is virtually useless. If the system crashes and you need to restore from the backup, you’re “SOL”, since your backup isn’t accessible. That’s like keeping copies of your important paperwork in the same file cabinet as the originals. The problem I’ve seen with Windows backup solutions is that I haven’t seen any “bare metal” solutions. That is, one which can restore the system onto an empty drive, such as after a drive crash. The ones I’ve seen all appear to require that you reinstall Windows and then the backup software in order to run the restore. I know of such a utility for Unix/Linux, but they don’t have a Windows version. Even Acronis, which Leo recommends in his previous post, appears to lack this ability. I’m like Mary who commented earlier. The whole backup process and terminology totally baffles me. I’ve tried and tried to backup with no success. I have several free backup space with my AOL and with my Norton 360, but I fail every time I try. If I sent a help request, the response is so above my head it only frustrates me more. If someone – Leo, are you listening – if someone could tell me exactly in easy ComputerIlliterateLoretta words ala Step 1 do this, Step 2 do this through the whole process I might be able to finally backup. Meanwhile, I’m scared to death of my pc failing and me with no backup. 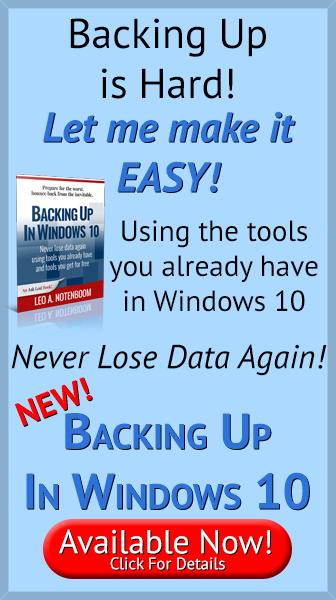 Thanks for listening and letting me vent…..
I’ve been resisting the appearance of pushing my own book, Maintaining Windows 7 – Backing Up, but it is indeed a step by step walk through of backing up a system using either Macrium reflect or Windows 7’s own included backup program. (The Macrium Reflect portions should apply to XP, Vista and 8 as well.) You can review the table of contents and the first few chapters in this pdf: click here to download. I’d love to hear how it does or does not address your needs. Thank you Leo, I have used various methods to backup and totally confused hope I have set them up correctly and pray I never need it as restoring seems even more fearful. Karen’s Replicator on an external drive lasted until Macrium Reflect persuaded me to use it but not with any confidence. I have just invested in the digital version of your book and will now attempt to discover how to really set it up and restore. I don’t back up at all. The only tasks I use my computer for are email and surfing the web. I really don’t see any reason to back up; I don’t want to save any of the stuff I read while surfing and I don’t want to save any email. If a communication is really important, I send it by snail mail with a receipt requested form. About half the time,when I start a back up. The secound disc wont format. How can I fix this? Thank you. Yes, I aware of need to put backups on separate kind of media (disks, hard drive ect.) In article Leo ask, “So why don’t people back up?” I try to give one reason – confusion – because back up makers not very clear on what user needs for back up. I not angry at Acronis or back up makers. Many other softwares makers guilty of thinking peoples understand information. I want makers tell me everything like I a baby. More information better than not enough. Use XXClone. Very user friendly and step by step instructions. I experienced catastrophic data loss very early in my computer-using-career – in about 1994. Since then I’ve always taken backups of one sort or the other, at varying levels of technical sophistication, and with various coverages. But I think that computer SELLERS are missing a marketing trick. Why sell you JUST that new laptop? Why not put a bundle together that includes an external hard drive and a decent piece of software to prompt you, on a weekly or monthly basis, to plug the drive in and it’ll do the backup for you? OK, it costs more, but surely they’d sell more kit too? And be seen to be putting customers’ interests first as well? Plus providing a bit of ‘education’ for computer buyers – at least making backup a slightly more visible option. So come on Dell, Lenovo, HP, Sony, I reckon there’s some profit to be made here! I know I should have an external hard drive rather than an internal one to protect from natural disasters, but at least I’m protected from losing everything on Drive C as long as Drive D is available and up to date. One question: why isn’t there one source for all information on backups, with easily understandable, step-by-step procedures for every eventuality? I think it’s a lack of an authoritative, “one-stop shopping” source that makes people give up on thinking about backups (or disk cloning, or whatever). I think it’s also important to have a backup offsite – most IT people know this (whether or not they practice it). I think most end users aren’t aware of this but unfortunately, if they were, they might be less likely to do backups in the first place. But I’ve worked recoveries many times where a home or business office was burglarized, and the perps took the backup because it was sitting on the computer. Or consider fires or floods – they tend to take everything that’s sitting in the same place too. A local school’s library burned down and, while they did do backups, it was a CD sitting in the desk drawer under the computer. After the fire, it was just a re-hardened blob of melted plastic. There’s a picture of the laptop in question here: http://datarecoveryworldwide.com/images/laptop_3.jpg Makes the idea of off-site backups a little more desirable. I use Acronis version 10, which I know is not the latest. I verify each backup after creating it. On at least two occasions when I have tried to access a backup, Acronis has claimed the file is not in .tib format–though it has that extension and was previously verified by Acronis. I keep several generations of backups on USB drives, so this situation was not a total disaster. But it is disconcerting to find that a supposedly valid backup is not usable, and such an experience might cause someone to give up on doing backups. Any file–not just an Acronis backup–might become inaccessible for one reason or another. So I think it is essential to keep more than one generation, or perhaps more than one copy, of a backup. As far as I can see, the reason people don’t back up is that it’s virtually impossible on a normal PC to do so. They don’t come standard with anything that can store enough data to do a decent backup, the software isn’t there by default to do it, and it’s very hard for a standard user to know what to back up and what not to. Things like their PST for their email are hidden away in an obscure directory, so even if they did have the time to feed dozens of CDs into the PC and then store them carefully afterwards, they probably would miss important data. tried acronis!!! it dont work!!! so complicated couldnt figure out how to do it!!! Acronis works fine for almost everyone, you just couldn’t figure out how to use it. Well, I’m pleased to hear that Acronis does, in fact, have a “bare metal” restore ability. I may just look into it further. As to Ben’s comment about 119-page manuals, I’d have to agree that that would be a bit intimidating/overwhelming for most people. Perhaps a solution to that might be to have backup solution providers include a small “getting started” pamphlet, which would take them through the installation and setting up pre-defined “full backup” and “weekly backup” scripts, and then running the “full backup” once. I think another obstacle is that many people think that we “techies” can perform miracles, because we sometimes manage to do just that. Why bother with the “hassle” of making backups if help is just a phone call away if (“when”?) the system crashes? My wife’s cousin’s system crashed. He had all of his business data on it, and of course not a single backup. We managed to recover it. We got him a tape backup for Christmas. (He said he’d install it, despite our offer to do so for him.) Several months later, his system crashed again. He never even installed the drive, and had no backups. We pulled a second miracle and recovered the system again, and this time we installed the tape drive. We even made a backup for him. Well, some six months later, you guessed it, this aging system died again. This time, however, he did have a backup — the one we made some six months earlier, which was still in the drive. Once again, we perform a miracle and recover his system. Fortunately, he got a new system shortly thereafter, though I don’t know if he ever made backups. Recently I felt that bacup is very essential because there is some problem in my machine that’s why i can’t open my machine but at the same time i need my programme and the data base for my immidiate purposes.And i can’t do anything because i have no other options. But it is still true that before it happen i have no realisation about the backup facilities.If I have then i obviously do that.That’s why i appreciate Leo for published this type of article by which we are aware about back up and its advantages. So lack of knowledge is one of the many criteria for the people not to store back up data. So I had a nice, current Acronis 10 HDD image ‘safely’ stored on an external USB drive. Then my XP Pro system wouldn’t boot up *but* I was then unable to access my DVD drive. Therefore the image was useless. A miracle was performed whereby my one year old HDD, which was replete with bad sectors, was replaced and the OS restored via Recovery Disks. For this experience, $245 and I parted company. i find, that the easyiest way to backup is by using a OTB soloution inbuilt into a external usb HDD enclosure, welland make a cheap one for about AUS $35. ( case only) all you do is set the program up, plug in the dirve and press the OTB button on the back, it will then automaticly copy or sync everything you want from your computer to the HDD. then you unplug it, put it in the cupboard for another week, its easy as that. and because its a standard 3.5 case, you can change the HDD or even pull the HDD out and put it in the machine itself for faster copying. The answer is simple. So many of us do not understand how to do this operation. Myself included. I’ve come to the conclusion that I might need a software program to walk me through it and allow my PC to backup on my CD-R’s. My OS is Windows 2000 that allows me to backup everything on my C-disk (drive) and that sure does not make any sense. Any free backup programs out there? Novice but trying. You actually do not need a “backup” program. All you need is an external Hard Drive. Plug that into a USB port and copy & paste all of “My Documents”, My Pictures and “My Music” from your PC’s “C” drive to your new external Hard Drive. That’s it. Eventually your internal Hard Drive in your PC will fail. When that happens buy a new Hard Drive that is compatible with your PC, have someone install it, then reinstall your OS (Windows 2000). After you reinstall the OS then connect your external HD with your backup then just copy & paste everything from your external HD to your new internal HD. Then reinstall your programs, e.g. Microsoft Office 2003. Any time you make assumptions things can get dicey quickly. But this is absolutely better than no backup at all. Back up is time-consuming and not reliable. If you back up on your computer and your computer crashes, you have lost every thing. If you back up to a CD or DVD, it can scratch and you’ve lost every thing. If you back up to an external hard drive and it scratches and fails, you’ve lost every thing. If you back up to a zip disk and then it malfunctions, you’ve lost every thing. If you back up to a flash drive and the internal car fails or the thingamig USB gets loose, you’ve lost every thing. How about the simple “Briefcase” for backup? Very straight-forward and has been working pretty well for me. Terri: Wow. I gotta say, that’s a pretty depressing summary. But in fact it’s inaccurate. backed up. Lose either one, and you’re still ok. I tried to backup with my computer’s instructions but I don’t have an F drive. I just have c and d drives so how would I backup my system? It depends on the capabilities of your backup program. drive to back up to. “The answer is simple. So many of us do not understand how to do this operation”. Many/most ‘ordinary’ users do not ‘understand’ the process. Like . . what is happening during the backup . . . is it a copy? . . how do you explain ‘another drive’. . . a partition? . . . incremental, . . sync etc. Being able to relate these simple words which everyone basically understands to the computer operation by ‘ordinary users’ is difficult. I believe many ordinary users cannot ‘visualize’ or relate to the process in such a way that they can understand it and accordingly embrace it and use it for it’s value and importance. I, alas, am among the many ‘ordinary users’ seeking simplicity. In Flori-duh. There are two types of people. Those who backup and those who have yet to lose everything to a system crash. Acronis True Image has saved me a couple of times. On my system it takes only 30 minutes to backup to a USB drive, and only 30 minutes to restore when something gets screwed up. I can even grab just one file off the backup if I needed it. With the upcoming Windows XP SP3 update, you would have to be dumb or be really lucky to do the install without first doing a full backup. Gee some of these inputs are dated but still worth reading. I had my fingers burned in transferring from XP to Windows 7. A supposedly sturdy program of German/US origin, intended to back up my whole XP system and do nothing more than shift it to my Win 7. There it is still sitting shadowed on my external USB hard drive, as useless as the day I started the process. So now I use that HD for backup but use only what the drive menu provides from the drive itself. THE BIG QUESTION. Will it work when I need it or will it do the same as last time and sit there taunting me for my stupidity . I’ve been reading lots of articles on backup, trying to settle on the best method and usually finish up turning to something else and hoping all will be well if my puny efforts are ever needed. Yes I’ve had some devastating losses in the last 18 years but the XP to Win7 experience did nothing to bolster my confidence in backup. Good subject nicely written Leo, thanks a lot. I agree with those that say that backup is not only time consuming, but isn’t full proof and can fail as well. Nothing is 100% full proof. However there are exceedingly different things and ways you can do things, to improve that ever so slim chance of you not being able to recover with your backup, to the chance that you will be able to. I for example, increase the chances of recovering from a backup in the event that there is not only a system failure, but a backup failure by making several backups. I also keep a backup not only on each of those types, but a 2nd set of those in a different area of the house within a fire proof, etc… safe, in the event that there is a catastrophic fire or other disaster. That way where one fails, or is destroyed, with any remote slinder chance of luck, the data will not be lost.. It is also key to not have too many sets of copies… thats why i only have 2… one easily accessible…and another in a safe… both of course accessible by lock only, to prevent theft.. It may seem a little extreme to some, but if it keeps me from loosing my data in any way shape or form, with the very very slim and rare chance of total utter catastrophy… Then it is well worth it..
Hopefully to some that are willing to go to those lengths it is worth it to them as well. I love Mary’s comment!! I’m with her! I didn’t know I would need to learn a whole other language to operate this blasted thing (which has quickly become a necessary evil)! There are so many terms I have yet to figure out and I have neither the time nor desire to learn either. However, believe it or not, I just installed a new hard drive and it was surprisingly easy! I still had the Operating System CD that came with the computer, plus I had CD backups of my pictures and documents and the CDs from the programs I’d installed (family tree maker, quicken, etc.). I just updated everything from online sources and now I’m back in business — I’m happy! My best recommendation is just to copy My Documents to a CD (two different CDs, perhaps by two different programs, just in case a scratch happens. Forget about restoring programs and Windows, etc. They will only restore on the SAME computer if nothing else has gone wrong. Just backup docs and photos and forget about the rest. It’s useless. How ill informed you are Terri. In the event of ANY software related problem (including ransom ware or other malware) this can then be used to restore your computer to the state it was in when the disc image was made. Also, if the hard drive of your PC fails then (with the right restore program – such as Macrium Reflect Free Version) you can restore to a replacement hard drive or even to a new machine of a similar specification. You really do need to stop giving out bad advice Terri and take a more subjective and less emotive view of the the facts about backing up because you clearly are not sufficiently well informed and are passing on your ideas which could lead to people boxing themselves into a corner due to their lack of a full system backup. Backing up can be a bit daunting at first but with a little effort and research you will soon get the hang of it and should come to value it as the best way to extricate your PC from pretty serious software issues. Does anyone know how to disable Backup in Windows 2000 Pro? The reason I ask this is because I found that my desktop was repeatedly backing all my Word documents each time I opened a file. Even when I deleted the backup, a new one would instantly appear in its place. Eventually I managed to work round the problem by getting Backup to exclude all Word documents from the backup process… well, I hope this is the case. At any rate the problem appears to have disappeared for the time being at least. However, I would like to rid myself of the Backup program altogether – or at least disable it to the point whereby I feel I’m in charge of it rather than having it pulling all the strings in the background. Unfortunately MS’s Help files fail to explain how this objective may be achieved and not being a PC technocrat I’m reluctant to play the sorcerer’s apprentice here. On a related issue I have no objections to System Restore but I’d have plenty if Backup was surreptitiously (not to say pointlessly) filling my H/D with copies of files from other applications. Or do I have to laboriously exclude them too? Much better, it seems to me, is to shut the whole program down and let me back up my files manually, which is what I’ve been doing for some twelve years now. So if anyone can tell me how to put Backup back into its box, I’d be very grateful. PS. I apologise for the location of this comment/query of mine. It’s just that I am unable to find anywhere more suitable to place it on this section of your website. So why people back up other’s internet communications and how to avoid it? I would ask. While ago my account was compromised and a Windows live account was created using my complete yahoo email address, after contacting with Hotmail abuse and so on, it was imposible tocancel that account that i did not create, as they kept saying it was spam and i had to block it as sender. Today I think, via that Windows Live account, all my communication via internet, emails and browser search, etc. have been backed up without my consent. I have changed antivirus and online security a couple of times but this doesn’t stop this kind of hacking my communicatons. I use Carbonite but I have never had to use it. Please give us your opinion of this as a backup strategy. In particular, what is the downside? I hear good things about Carbonite. My take on online backup in general can be found here: Is an online backup service a good idea? Recently I did a unit on magnetic storage with a couple of my classes and took the opportunity to preach on the need to back up. I told them about Macrium. I also them that if they didn’t do an image backup, they should at least copy the contents of My Documents, My Pictures etc to an external drive. Then for homework, I told them to back up their computers. The next week, a student came into class with an external drive under his arm. He said he had the error message that Windows couldn’t recognize the disk and it needed to be formatted. I used the opportunity to make a few comments about offending the backup gods and the consequences of not doing homework. Then as a class project, I downloaded and installed Easus Partition Master. as I remembered using it to fix unrecognized disks. I used the check partition option which found an error. It didn’t do anything itself, but it ran chkdsk.exe /r. That solved the problem and made his disk recognizable. Now when I recommended the backup software, they all took good notes on it. I mentioned Macrium, but I also told them they could check out EaseUS Todo backup free which has the capability of free incremental backup. I told them that I’ll crash their drives if they don’t do their homework and back up. Do any of you out there have any experience with EaseUS Todo Backup Free. Either positive or negative? Mark, I installed version 5.8 of EaseUS Todo Backup Free and it works as designed. There is one drawback, however: the free version will NOT do “differential” backups, only “incremental,” which means multiple stored files in the backup folder. I limit the backup to keep only 7 days worth, which means a full backup every week, and incrementals the rest of the week. One nice feature that I like is that you can “mount” the backup and restore individual files (or just browse the image.) I was a bit leery of installing it on my computer because the software is created by a Chinese company, CHENGDU Yiwo Tech Development Co. Ltd. I use EaseUS Todo Backup Free and like it. Mind you, it’s the only thing I tried after the abysmal failure of using the Windows Backup. There isn’t a lot of support for free users, but there is a forum and the answers are not always clear, mainly, I think because English is not the primary language of the developer. I had a pleasant surprise recently after restoring my XP machine to factory state (I chose the no-reformat option, so didn’t need to restore from my backup). Prior to running the restore software from the hidden partition, I downloaded the install file as I couldn’t find it on my hard drive. Consequently I got the most recent version (I had been using an older version). After my machine was back up and running, I was checking out the new version of EaseUS Todo Backup Free that I had just installed. I wanted to see if I could access the backups from the older version. To my surprise, I found that I could open the full image backup file, just like it was a folder on my external drive. I could then navigate through the file structure that had been backed up and select any file I wanted and could have done a copy and paste to my hard drive (if I needed to restore an individual file). My understanding (from the older version) was that you could not restore an individual file from an incremental. Now you can! I used to do two backups: a drive image and a data backup (of c:\documents and settings\james so I could access a specific data file, if needed). Now I just have to do the drive image. I need to go back to Leo’s list, but I think EaseUS Todo Backup Free might just meet Leo’s list of required features in a backup program. Thanks, James. I’m running EauseUS Todo Backup on 2 computers, one for a friend and the other on my netbook, which is essentially expendable, as there is no data on it which isn’t in Dropbox. I asked because although my friend runs it daily, and I run it occasionally on the netbook, there’s no way sure of knowing how well it works till you have a crash. It has a small footprint. I have it set to automatically back up while she is working and she doesn’t even know it’s running. I also wrote a tiny batch file to back up the essential data, just in case there’s a problem with EaseUS. On my main computer, I use Macrium and I have used that 3 times to restore. That one’s tried and proven for me. I don’t use a batch file with that one. I have used Carbonite for a couple of years. I’ve had to re-install my Carbonite backed up files twice, both times for hard drive failure on my laptop – it was a breeze to get my documents and pictures back. Carbonite backups up automatically, in the background and is easy to set up. easy to get your files back. And, an important plus for me, it’s off-site. Question: did you restore your entire system using Carbonite, or did you have to reinstall Windows and applications before you restored your documents from Carbonite? I had my first computer on my office desk in around 1980/81 (Commodore PET with tape drive and 2 external floppy drives, 32k all up….! ), and have been backing up irregularly ever since. Bad news – it hasn’t got any simpler; good news – it’s cheaper. But the main issue for me and most users is the gulf between the easy-to-make, easy-to-recognise, easy-to-use, copy of a file you don’t want to lose, and the all-but-incomprehensible stuff that appears on the USB external drive you put the backup on. The key to why we don’t do this better is that most back-up systems are designed to be used only once (when you’re in a real fix, and real stressed), so we never get entirely comfortable with them, or get to practise much….we hope. Greetings Leo and everyone else. I thought I’d share my backup method with you all. I’ve tried all sorts of programs over the years and I settled on the following method as the best (certainly for me, anyway) quite a long time ago. It’s been working perfectly for more than a decade. I simply use batch files based on the old DOS xcopy command with a selection of switches that duplicates directories as needed, only overwrites files that have been changed, etc. The batch files live on my desktop and the method has worked absolutely faultlessly with Windows 95, XP, Vista and now 7. You need to have a very organized directory structure to use this method but pretty much anyone who’s been computing since DOS probably has this. It’s very fast. Just double ‘click’ the icon for each of the batch files and it simply works through the relevant directory structure and overwrites only what’s been changed, or adds any new files. I plug in an external hard drive that gets written to first and then the process repeats on a second internally mounted hard drive. So, as a minimum everything is on C, E and F. This happens after every work session, sometimes during, depending on what I’m doing. I also use another, larger external hard drive usually at the end of the work week. So, that’s an extra F drive and I keep it in a fireproof safe. The other external drive (the more frequently used F drive) is always with me when I leave home, which is where I work about half of the time. This process is so easy you wouldn’t believe it. Sure, there’s no compression or encryption but I’ve never used those features in any software I’ve tried. When I go to my backups I want instant and easy access to the files and these days storage is cheap. The batch files are very easy to modify if needs be. I tend have particular batch files for logical groups of directories and files like work (obviously), research material, educational material, completed work, family matters and so on. If I ever need to restore the directories and files I can simply drop the whole identical structure back onto my C drive and keep working. And, not least, it’s a free solution. One thing that’s important to recognize here is that you are only backing up your data, and not your system. Should you have a failure you’re looking at reinstalling the OS and all applications before restoring your data from backup. As long as that’s a choice, fantastic, but it’s important for all to realize. That’s quite true but I’ve always felt that if I’ve had a catastrophic failure a complete reinstall of the system isn’t such a bad idea. It’s a bit of a hassle but it’s not the end of the world. It’s a bit like sending my machine (a valued employee) off to a health spa for a spot of rejuvenation. I mentioned the bigger F drive that I use weekly and keep in a fireproof safe. That drive holds copies of all my program installation files, so they’re to hand if I have to completely rebuild the system. And when I install programs I keep notes of the settings and product keys used, all backed up of course, by means of my Administration.bat batch file. I learned the importance of doing this the hard way. To summarize, the operating system and program files are all fairly easily replaceable. Operationally created files are not. These are the ones that need the most careful duplication. I forgot to mention that I also use a large capacity USB microdrive as a third F drive. It contains copies of all my administrative databases and associated files and all of my work that’s currently in progress. That drive is kept in my pocket at all times. Leo, you’d obviously know what I’m talking about. Why don’t you cover the subject of how to use batch files in this way in one of your excellent newsletters, and also write a few representative sample files that people could grab and modify for their own purposes. A few hints on maintaining an effective directory structure would also help. This would save quite a bit of heartache for quite a lot of people. A friend of mine regularly backed up his computer to an external drive. Sometimes he would move old files to the external. Because the external was his back-up media he didn’t consider that the archive files were now single copy. That is, until his drive tanked. Too bad for the archived files. I buy external drives in pairs. I back up my computer once a week, then use robocopy to sync that external to the paired external. This protects me from computer failure as well as a failure of one of the externals. The chances of both external drives failing at the same time are remote. When I was a kid in photography club in the seventies, I took a black and white picture of the bird in the maple tree in the school yard with my mom’s old Kodak Brownie camera, I took the film out in a dark room and developed it. The film negative was a thing, and I could make as many prints as I cared to make. The print hung on the refrigerator for awhile. It’s long gone now. When I learned how to type in high school on an IBM electric Typewriter, each page was a thing. You could copy a page in the library for a nickel, or use carbon paper when you typed it. When I went to college in the early 80’s, I brought a manual typewriter with a correction ribbon. I hated retyping so I would write everything out first and do my copy editing before I typed. If I made a mistake, I literally would cut and paste pages and copy them on the copier to assemble documents. Apart from fingerprints, heavy erasures and coffee stains, there was no metadata. I though I was being clever until I stumbled into the “mac lab” in the basement of the English Department and started using the first Mac to do the same thing without scissors, tape or white out. And these documents could be assembled into binders, with pictures and prints, or catalogs, or scrapbooks that you could page through. When I submit a document to a court, even electronically, I still think of it as a thing. The thing that has the original signatures and certifications affixed or stamped by a human clerk. The thing that is certified under penalties of perjury. The thing that you can rely on; the thing that is authentic. I don’t like backing up because it is a paradigm shift. A document is no longer a thing. It is a voyeuristic procession of high speed stop-motion photographic data points. It gives me stress just thinking about it. At least when you are trying to push a block up to the top of a pyramid, there’s an implicit promise that you’ll have a pyramid to look at – even if the effort kills you first. The software programs still give the illusion that they are letting you create things: Ledgers, Documents, Photographs. They do not. It’s like a Pringles can loaded with springs just waiting for some unsuspecting person to open the lid, then SPROING the springs are flying every which way. Honestly, I’d almost rather have the damn thing crash, just to stop the manic digital cycle of death and rebirth. I have a program on an external device called “Click Free” — you plug it in, it backs up, and I use it once a week. It duplicates changes according to the blurb about this product. Is it a good product? It is certainly easy and costs about $120. I’ve never had to re do my programs, and I use Windows XP. I have tried different methods thru the years and find all of them confusing. I bought a little Hard Drive and thought I had it mastered but the day came when it gave me a message that I did not understand. I now have Carbonite which I had to setup to backup certain files and hope it is working properly. The “how-to” instructions are never in plain english so I don’t understand thme, either. I just wish there was a way to just put a CD Disk in the drive and press “backup” and that would be that. I learned the hard way and should have known better. I lost my hard drive and the newest backup was 3 months old. I had been using Acronis True Image for several years. The latest, 2013, gave me problems. It took a while to track it down. When selecting “Computer” from the desktop, Windows Explorer opened but went nowhere. The same with the network icon. The Task Manager would show “dllhosts.exe” that started but is supposed to terminate when ever it is used. Sometimes things worked/sometimes not. About 50-50. The log files showed the error but none of the recommended fixes worked. I found some threads that many had this problem and was caused by Acronis TI 2012 and 2013. I disabled this and the problem went away. I switched to EaseUS 5.8 and things are happy again. I do a nightly backup of my every day data and a weekly disk backup (full followed by 5 incrementals). Well… They say that the world is divided into two different types of people – thos who have had a hard disk failure, and those who haven’t – yet ! I had mine a few weeks ago. Yes, it’s scary ! Luckily for me, the manufacturer [Thank you, WD !] replaced the adaptor plug, and all was well ! What I have done in the past is simply to copy ALL my data onto an external drive. So I have about a dozen of these floating around, with much duplicate old data. So I have just finished writing a program in Excel VBA which does what *I* want ! It simply copies ONLY the files that don’t already exist (as an identical file) on the backup. Also, if a previous version of a file does exist, it adds the date stamp onto the name, and then copies the new version. So my backup drive now holds all versions of every data file. AND – there is an option to delete the Source file, so I can transfer all *different* files from all my back-up drives onto a “consolidated” backup, and retrieve the space on the other drives – onto which I can copy all the files on my backup drive, to create a second (identical) backup to go under a different roof (the only “true” backup !). All files are copied “as is”, i.e. no ZIPping or similar compression, so all files are easily readable and retrievable. THAT is what I wanted ! And none of the commercial progs seems to do that. However… [there’s always one, isn’t there !] I still need some sort of commercial backup for my OS and software ! Reminder – CDs / DVDs can have a life of only five years. One thing often not mentioned is the importance of verifying backups to make sure they actually worked. In most cases this can be set in the options of the backup program. I had the experience of faithfully backing up regularly only to discover that my backup drive was scrambling my data. It took me about three weeks to totally recover. Fortunately I was a full-time writer and most of my important documents where scattered around the country with reviewers. I was also able to recover most of my templates that way. But I did have to reenter most of a year’s worth of accounting information from scratch. Like someone else mentioned, we tend to expect that things will work. It’s rather exasperating to discover the hard way that they don’t always do what thought they did…. I moved everything to Dropbox. When I started my small businesses, I needed to have access to the info from the desktop, laptop. and smartphone. As time went on, I began moving more and more up go Drop box as I needed photography, logos, business cards, banking info, taxes, etc. It took me a while and it costs me money but it’s always there when I need it and I’m not frustrated by not being able to get to info when I need. I’ve been using it for two years now and never had a single problem. I’ve been using XXClone for quite a long time. It’s quick, efficient and easy to use. The only *hassle* is removing the side of the case and plugging in another drive. It’ll clone your entire drive, partition by partition, and you don’t have to do it in Safe Mode or anything. It’ll even copy open\in-use files, etc. Plus, there’s an option to make the Target Drive bootable. It really works great! I use Robocopy to maintain identical copies of most of my data (E: drive) on my RAID 1 desktop and a non-RAID laptop. A half- solution, since no data on the C: drive is backed up, but if I suddenly have to travel, I can make my laptop mostly current in about 10 minutes and go. One day I’ll try to figure out that sacred data that Windows controls, but this is good enough for now. A good friend and UNIX guru loves to point out to me that UNIX of almost (?) all flavors has supported a REAL dynamic backup facility since the Dawn of Time. If his machine fails in any way, he can simply take a new, compatible machine out of the box, make the backup data accessible, light up the (built-in) restore function, and resume from more-or-less exactly where he left off after a reasonable restore time, with no intervention. I don’t do a back-up per se, but I do, on a weekly basis, copy My Documents to an external hard drive. The My Documents folder contains all the software I’ve downloaded, all my music, files, photos – everything I need. I also have all the system discs that came with my computer, or that I have bought separately. I’ve used them three times – once after a hard disc failure (my local PC shop repaired the physical damage and I simply reinstalled everything. No losses, no hassle) and twice after general maintenance to clear out the dead wood and get rid of software rot. It’s no big deal for me to go through the installation process again; in fact, it’s beneficial, because I can then just reinstall what I actually need. Works for me, anyway! Like many, I never backed up until after my hard drive crashed years ago. Since then, I’ve escaped this indignity although I have come close (and I’ve had three external HDs used as backup repositories go bad). Based on Leo’s recommendations, I formerly used Acronis True Image and recently switched to Macrium Reflect to backup to an external hard drive. Neither is user friendly for a lay person. However, when my internal C: drive was failing (making noise and sending warnings via Windows), my hired geek found Acronis easy to use to clone my drive to a new internal drive. When I had problems with Acronis, I was walked through fixing them via online chat with the company, a process that always took more than an hour but got results. Even with Leo’s instructions, I found setting up my image backups on Macrium somewhat confusing. I did it wrong the first time and then got it right the second, but realized I wanted verification (an option he didn’t suggest), so I will have to redo it again. I’m still foggy on the difference between an image backup and a clone. I’ve written an article about backup strategies for an iinsurance ndustry magazine. The IT expert I interviewed said his company has a multi-level backup system. They backup to an external drive in-house, another external drive someone takes home, to a cloud account, and to a second computer at another location of their firm. There may be one more method I’ve forgotten. Bottom line – their data is mission critical. Without it, they’re out of business. If that’s true for you, take their advice. You can’t backup too much, but it’s easy to backup too little. I am still using an old laptop (Dell Latitude C640) with xp pro. It was given to me about six or seven years ago as it had a few problems, and the “IT guy” didn’t think it was worth even trying to save. I got it functioning with, among other things, a new hard-drive. Reinstalling all of the software (and the updates) is not something I ever wanted to do again so, I looked for options to clone or mirror the hard drive because, if there was another hard-drive failure, I wanted to just remove the failed drive and insert a new one, which takes about 3 minutes instead of 3 days. The Bios on this machine does not access the USB on boot so, an external drive wouldn’t work for a clone or mirror as there are certain files which need to be copied to the backup drive during the next boot after making a clone or mirror. However, this laptop does have the option of using, and booting, a hard drive in the modular bay (an area in the front of the unit where you can plug in an extra battery or a floppy drive or cd/dvd drive, etc.). I purchased a hard drive enclosure that fits the modular bay and placed a new hard drive in it (4 screws and a few minutes). After researching for days for what I thought would be the best solution, I bought a program called Mirrorfolder and installed it. I set it up so that I can just plug it in whenever I want to back up the system, about once every week or two. The program allows for a raid type of function but, I don’t have “ongoing-critical-data-saving-needs” and I also can’t see backing up to a drive that is always “on” and wearing out. The first time that I found “bad sectors” on the hard drive, I changed the settings in Mirrorfolder and left it in all the time (for continuous backup) and I bought a new hard-drive to have on standby as I knew it was only a matter of time before the laptops hard-drive would run out of extra sectors for repair. A month later it gave up the ghost. I replaced the hard drive in the laptop with the backup drive from the modular bay and booted it. I then placed the new hard drive in the modular bay and made another mirror. I went from a failed hard drive to a laptop that functions exactly like it did the day before in less than 5 minutes! I think that I will always have a mirror for a backup solution because it saves so much time. On a different note: Thank you Leo, I enjoy reading your articles and the comments to same. I do not use a backup program per se, in a manner of speaking I am the backup program and the only one I trust! I manually copy “Documents, Music, Pictures. etc to an external Hard Drive. If my internal HD in my PC should die, I install a new HD, reinstall Windows 7 and copy the data from the external HD to my new internal HD. I did at one time use Acronis True Image. The program did indeed backup but it failed to restore the image when the time came and needles to say I lost a lot of important data. This is why I don’t trust backup programs. I have been burned as Leo would say. As I stated I am the backup program and the only one that I trust. My method has worked flawlessly for a number of years. As for reinstalling Windows 7, nothing could be easier. I do that about every two years just to get rid of software rot! Back it up! Back it up! Back it up! I can’t tell you how many times where a backup has “saved my bacon!” Without a backup and, if you cannot determine what happened or where the problem is, your almost left without any other recourse than to “CLEAN INSTALL” and start all over again. For me, a clean install takes 3 to 5 days to reinstall everything including getting all of the MS updates for my Windows OS. For a long time early on in my computer usage “career” I didn’t backup nor even worried about it. However, I acquired Acronis True Image and have been thankful ever since. I usually do “full backups” about every 2 to 3 days and more often as needed. Just a couple of days ago there was an update to the firewall application I use. I did a backup before installing the update. I am very glad I did. The new version created problems primarily causing extremely slow boot-ups. So I used the backup I made to restore my computer to the way it was before installing the program update. The same can be said also in the event of a virus/trojan, etc., infections. Just restore to a previous backup and begin from that date of the last good backup. Thank God for backups! Yes, we learned by bitter experience. My wife’s laptop (Mac) which she kept everything on, had a hard drive which started with minor problems (should have been a warning), then died. The Mac people couldn’t do anything with it, or even recover the data. The hard drive was replaced, with a recommendation that we get an external hard drive for backups. That external hard drive also died after years of use, but it only had backups, so the originals on the computer were preserved this time. So, now our system looks like this: Our home wireless system has a 3 TB hard drive which we can both use (private spaces and public space). One of my wife’s computers (her genealogy computer, a PC) has it’s own external hard drive as well. Her Mac uses the system hard drive. My computer (PC) has two external hard drives, a big one for regular backups, and a small (portable) one which I got for going to meetings (while working on a joint project) but now just use as another backup. 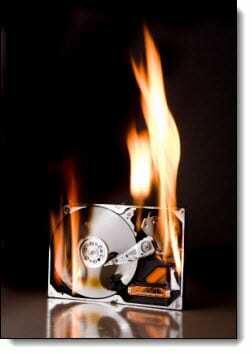 We both use automatic backup programs as well as backing up critical data (such as photographs) to CD’s and DVD’s. Photographs are the worst thing to loose. You can’t go back in time. So, all my photographs also reside in the system hard drive as well as both my external hard drives. This also allows anyone on the system to view them. Sounds like overkill now that I have written it out, but redundancy is good. Can you explain how you’ve linked an external 3tb harddrive onto your wifi system so you can back up to it from different laptops? Or is that not what you are saying? That’s not what I was saying, but I could. All I have to do is share the drive and then configure it as the backup target for whatever machine is backing up. I have an external hard drive that I bought for doing backups. WD Elements. It is incredibly complicated to use and took almost 2 days. I agree with other posters who say that the confusion is what stops many people from backing up. I hook it up once in a while and do a backup but the process is not intuitive at all. Also, the thought just occurred to me… I’m still using an old Windows XP. What are the complications going to be if I have to use this backup to put things on a new PC some day? I don’t think that it would be very easy to get my old backup info from various programs to play nice with a completely new, updated bunch of software. Comments? When you use an older backup with a newer system you don’t use it to restore programs or the system itself (you wouldn’t, for example, want to “restore” Windows Vista back on top of your new Windows 7 machine). The tremendous value of a backup in that scenario is that your data is backed up. You can recover your data to whatever system you like. 01 Connect your external HD to a USB port on your PC. 02 Copy & Paste all of “My Documents”, My Pictures and “My Music” from your PC ‘s “C” drive to your WD Elements. 03 Back up your email program and your Firefox browser to your desktop then copy & paste those to your your WD Elelments. 04 After you complete steps 02 & 03 safely disconnect your WD Elements. You are done! It should take you no more than 2 hours tops! I just recently went from Windows XP to Windows 7. All of my data was saved and works on Windows 7. I lost no data at all! I repeat: I lost no data at all.! In addition most of my programs that I used on Windows XP work work in Windows 7. As Leo stated you don’t backup the programs just the data. On Windows XP I used a free burning program called CD Burner XP. Once I got my new PC with Windows 7 connected my external HD, copy & pasted all of my data to the “C” drive on my new PC then my next step was to load my programs on it. Most of the programs I use are free. I download a new version of CD Burner XP and it works just great on Windows 7. Same for Songbird. Songbird is a free music player that I used on Windows XP and it works just great on Windows 7. So backing up does not need to be complicated or time consuming. It is just a simple copy & paste procedure. And my method is intuitive. BTW I used to use an image backup program called Acronis True Image. The program did backup alright but when the time came to restore the image the procedure failed. The image would not restore. Needless to say I did lose GB’s data. Lucky for me I had all of “My Music” (which is very important to me) backed up separately to a 32 GB flash drive so I at least saved my music but all of my other data was lost forever. I was burned by a backup program and will never use one again. I just don’t trust them. I am the backup program and the only one I trust!! Leo, I have been backing up computers in our house for quite a few years now. I have to admit I have many external HDD’s to do just this and nothing else……..I do not use an online back up service, mainly because of cost. When I do a full image backup, that uses a lot of disk space on my dedicated external HDD’s, so each time I back up, I try to update just those files that weren’t backed up one week prior. I still wind up using a lot of space, which gets costly to me because of buying HDD’s, but also an online service that one uses for the same reason can be very costly as well over the years. Bottom line: The cost is, I think, one of the main contributing factors why backing up is not as important to as many people as it should be. What would you advise considering this scenario of mine, and I’m sure many others as well? Thanks. The key to any long term backup strategy is deciding how long you want to keep your backups. Once you decide which (old) backups can be deleted that, then, frees up space and/or hard drives for reuse with current backups. In my case I keep my daily incremental backups for two months, my monthly full backups for about 3-6 months, I select one of the quarterly backups to keep for a year, and the backup I take on January 1 of every year I keep “forever”. Now that’s probably WAY more than most people need, but you get the idea. Generally every month I’m deleting old backups of some sort and that frees up space for the newer ones. I keep 1 full image of the bare operating system partition with drivers and essentials until I upgrade the operating system. I create a full backup image every 3 months and delete the old one. The used space doesn’t increase much with just the operating system partition. Incremental and Differential backups are good for businesses with no storage limitations, but I find they’re not realistic for most home users. I don’t store anything on a computer that I can not afford to lose. Saves a whole lot of time and money. Being a fervent admirer of our mentor, I followed his advice re “backup backup bacup” and purchased a famous named backup external drive for my XP desktop. Commeth the day and both hard drive and power were blasted by an electrical storm. This was then I realised the futility to listen to anyone using the term ‘backup’ without qualification. That is to say a ‘mirror image’ or ‘clone’ (both descriptions being the same of course) backup system. The problem after a crash is not regaining Documents, Photographs or Bookmarks but the program operating system. It is no use having a list telling you what programs you once enjoyed and have to laboriously download again but getting copies of special programs that you PAID for legitimately a long time ago. As many subscribers herewith have said (and I am so happy that I am not alone here) that explaining in SIMPLE ENGLISH is just not in the ‘geeks” remit or vocab to describe IN DETAIL just what is involved in achieving a mirror image unit, etc., that can be installed and used by itself (after a hard drive has crashed) on the computer and later transferred to the new hard disc and then used again and again if its memory permits. Because my legal Windows Home Edn disc appears to have been corrupted and cannot repair itself I will have to re-install Windows with SP3 all over again with the problems I have outlined above to be faced again and perhaps again. There are only two types of computer operators: those who have had a crash and those who are going to! Luckily where I work, my work is on a server which is backed up daily. However on my laptop, I use an external hard drive. I just had to reinstall Win 7 from scratch because Macrium Free would not restore a 2 week old clone of my hard drive from an external USB drive. What a pain! Shell out the money for the paid version. Free = You get what you pay for. For a few years in the dark ages, I would copy all my digital photos to an external harddrive (I now call it the Toaster, because it is a huge, ovoid clunky thing), but I did it manually and only when I thought about it. I didn’t use a real back up program until I saw Leo recommend Macrium a couple of years ago. At that point I was paranoid about losing all the various music and photos that were on three separate computers (2 kids’ laptops and a desktop.) I now run a Macrium backup once a month – but, again, it’s manual and I have to remember to get the external drive out of the closet, attach it, and go around to the three different machines. I almost wish I had my own server setup in my house to handle this automatically. Addition to previous comment: Another problem is the wi-fi issue. There are two or three laptops, all using wifi, in my house in addition to the desktop. Why isn’t there an easy way to attach ONE external backup drive to the main desktop, and back up the three laptops over wifi? I understand why people don’t back up. It’s COMPLICATED, and I’m a relatively tech-savvy person. If you share out the external drive on the desktop you should be able to configure your backup programs to backup over the network. I do something similar … my desktop actually backs up to another machine over the network. Any of my machines could. I’m on the fanatic side when it comes to backing up. I use Macrium Reflect and run a nightly automatic incremental backup. I use BackBlaze automatic cloud backup solution form my data and I use a dropBox folder for all of the files I’m currently working on to have an up to the second backup of my most recent files. Once a week I swap out my external backup drive with on I keep at work. Those who say you can get by with just a copy of My Documents, that might be OK for some, but I’ve recovered my system 3 times with Macrium Reflect and it was well worth the money and time setting up Macrium. Sure I could have reinstalled everything and recovered my data, but a reinstall from scratch takes a few days to get everything up and running again. My most recent recovery was from a spyware program that got me. I probably could have spent an hour solving the problem, but I simply ran the Macrium recovery and after a few hours spent out enjoying the sun, I came back to a perfectly clean system. For a friend who doesn’t want to spend the money on Macrium, I installed EaseUS Todo Backup. It backs up automatically every day while she is working. I also set her up with DropBox as her working directory. In addition I wrote a small .cmd file using xcopy to back up all of her data files. This works to recover accidentally deleted files etc. PWT, could you post copies of those batch files you use for backup ? Your method seems like a much better option than paying for a program that essentially does the same thing. To be clear a backup program of the type that I recommend does MUCH MUCH more than any batch file could. Batch files focus on saving the data that you’ve identified as needing to be saved – which is critical and important and better than no backup at all. A good backup program backs up everything, including all the things you forgot or didn’t know about, and also backs up your entire system including Windows and all your installed applications and settings. Leo is right, using batch files in this way does not back up your Windows installation or your program files. However, as I stated earlier, I don’t care about this. I don’t mind reinstalling them if I have to. I look on it as a system freshen up. However, you must make sure you have all the installation files backed up and ready to go along with all the settings and other information needed to reinstall them as quickly and efficiently as possible. If you are organized in this way, it should be a pretty smooth operation. And I should point out that I have a lot of program files. People generally freak when they see my desktop. I’m going to assume that you don’t know any of the old DOS commands. To anyone who does, sorry for stating the obvious. xcopy is an old DOS command that can copy more than one file at a time. The first asterisk of the pair separated by the dot *. * means any file name. The second asterisk, the one after the dot, means any file type. So, *. * means all files of all types. Any drive I plug into my computer becomes F:\ if no other drive is plugged in. /d if a source file has a more recent date than a file of the same name in the destination directory, the file in the destination file is overwritten by the source. If not, the destination file is not overwritten. /e copies all sub-directories under the directory specified, even if they’re empty. So, it duplicates the directory structure. /r copies over read only files. /h copies system files and files that are hidden. /i basically, if the destination doesn’t exist this switch makes it. /k ensures that if a source file that’s copied is read only, then the destination file will also be read only. On line 2 the same xcopy command is repeated however this time the files are written to a physically separate internal drive called E:\ which I find convenient. True, because it’s in the same case as the C:\ drive it is susceptible to power surges, theft and anything else that can compromise the C:\ drive but I find it handy to have backups ready and waiting for when I need them if a data file or two has been deleted or mistakenly overwritten for one reason or another. It happens. I also use Microsoft OneNote extensively. I let it put the files in the default location and I simply have lines in Work.bat that copy from there to my backup drives. Lines 3 and 5 both define the same source directory while lines 4 and 6 define the F:\ and E:\ destination directories. Same story with my Outlook files except that the backup commands for the .pst files are in my Admininstration.bat file. Under my basic C:\Work directory I have a sub-directory for each client. Under each client directory I have another sub-directory for each job for each client. There are often sub-directories under each job directory, too. Whenever I get another job, I simply make a new directory for it. The xcopy command (with the switches described) simply duplicates that directory and any files in it. Thereafter, it only overwrites newer versions of the existing files, or any new files I’ve created for that job. It’s fast, completely automatic and nothing can be forgotten. Anything that gets created or changed anywhere in any sub-directory under my C:\Work directory is backed up to the destination drives specified. It’s foolproof. Whenever a job is finished I manually move it to the C:\Completed Work directory which also contains separate sub-directories for my clients. This directory is also backed up by a batch file called, you guessed it, Completed Work.bat. Once the directories and files for finished stories have been moved to C:\Completed Work I manually delete them from F:\Work because otherwise the F:\Work directory and customer sub-directories would become cluttered with every job I’ve ever done. I could write a batch file to do this automatically but I prefer to do this manually for reasons relating to the nature of my work that I won’t go into here. I have directories for administration, accounts, research, education, e-books and a good many other things off my C:\ drive. Each of them has its own batch file with the appropriate source and destination files specified. I simply activate the batch file for whatever I’ve been doing. For instance, if I don’t write any invoices or receive any payments on a particular day, I don’t activate my Accounts.bat file. If I do operate in my accounting package, then I activate Accounts.bat when I’m finished. The basic form of all my backup .bat files is the same. In fact, I didn’t actually write my first one. I got it off the web somewhere that I can’t recall. Thanks to whoever it was who made it available at the time. If I need a new one I simply cut and paste from an existing one and alter the source and destination directories manually. If you’re going to use this method for backups you need to learn how to do this but it’s not difficult; you just have to be careful. When you first start, make some test directories and files and make sure everything is being copied where you want it to be copied and in the way that you want. Test extensively to set your mind at rest. Only directory names that have spaces have to be specified inside quotation marks as shown. If there are no spaces in your directory names you don’t need the quotes. However, even if you don’t have spaces in your directory names, it doesn’t hurt to include the quotation marks. If you make it a practice to include them then you’ll never forget them when you do need them. Actually, I should probably point out explicitly that the numbers (1, 2, 3, 4, 5 & 6) at the beginning of each line in the batch file are simply there for reference. Don’t include them in your own batch files. Another thing I should mention is that I have a batch file that backs up the configuration, preferences, scripts, add-ons, etc for many of the programs I have installed, so these are easily restored upon re-installation of the program files. I also have batch files to re-install these things to the correct locations automatically. Basically, doing so is pretty much a reversal of the commands in the backup file. For people who are confused and don’t know where to start, I suggest going out and buying an external USB harddrive. A manual copy and paste is far from perfect and may miss many important files, but it is better than nothing. I purchased a WD (Western Digital) My Book Essential 3TB external harddrive. This came with backup software. You simply install the software on your computer and plug in the drive and it goes about making the backup by itself. As long as the backup drive is plugged into your computer it continually backs up changed files. Now I don’t actually use that software because of a big limitation (it only backs up My Documents, My Pictures, My Videos, etc. and I can’t customize the list – I’ve got data stored elsewhere in addition to those locations). Again, I find it’s not perfect, but it’s better than no backup strategy. I use EaseUS Todo Backup Free. The most recent version might just meet Leo’s list of requirements for good backup software. I use Macrium. You can’t find anything easier. I am doing back ups once a week to an external drive. I have also used a backup to change from my old hard drive to a new SSD. I simply made a backup of the old drive, took it out, put in the new SSD, rebooted using the rescue drive CD you make when you install Macrium, and restored my backup to the new drive. I have done it twice now including a new Win8 laptop that I replaced the hard drive with an SSD. Just about everything that can be said about this topic is covered in the previous comments. I’ve tried numerous programs and, yes, they can be horribly confusing. I’ve never had a catastrophic failure, and I’ve been part of the desktop community since 1969 and my first TRS-80. However, I have on occasion lost important files for one reason or another. If backing up files is quirky, recovering them can be just as bad. I even had one go-round with Carbonite where they couldn’t help me recover lost data that had supposedly been backed up. So, I’ve given up on all of these programs. What it boils down to is that there are probably only a dozen (maybe fewer) programs that I use all the time. Most of the data I store is in spreadsheets and word-processing files. So I just keep a thumb-drive plugged into a USB port, and all files are saved there in appropriate folders. Once a week I back up the thumb drive, and it’s backed up multiple times. I figure if I do have a catastrophic failure, reinstalling the OS on a new drive will cost me less time and frustration than going through all the confusion of using backup software. Especially if I discover after it happens that I can’t recover my files anyway. The simplest way is the best way. I can hold the thumb-drive in my hand, open it up on the computer and see all the files I need nicely stored there, and sleep at night. Well, here is a cautionary tale for everyone. For three years I have been hounding my SO to back up his laptop on a regular basis. As recently as three weeks ago I told him to buy an external hard drive and I would do it for him. Last night his car was broken into and his laptop was stolen. He will never get it back. On it were four years of everything related to his business. Everything. And no back up exists. DO NOT BE MY SO! BACK UP! I have bitten my tongue until it’s bleeding not to say I told you so. I setup Acronis True Image scheduled backups for our clients along with an external drive and ESATA dock for years. It was part of the package with new systems. We still had people come back with data loss issues, as they couldn’t be bothered turning the system on and connecting the external drive for the scheduled backups. Now I’m training in Business, which is mainly computer basics. The first thing participants are taught is to save as they go. That includes to a USB device (for our purposes) and to the system itself. Everything, everything, is saved twice. The mindset needs to change for computer users. Too many people have their hands held by IT help desks and never take the time to learn the basics. Nothing is more basic than backing up your work, and your system. Backup systems need to be considered a necessary part of using a computer, with time allocated like we would (certainly should) to ensure our anti-virus and operating system is up to date. It should be the last thing we do before shutting down after doing anything important. I think the author has great ideas, in a perfect world – but I just see Microsoft having to fight more losing court battles to implement such a thing. Apple will probably get away with it. My wife uses Karen’s Replicator. She loves it, but I find it difficult to understand. I had one bad experience where a file replicating software deleted heaps of files. Never again for me. I try to backup every 3 months or so. For me, it’s an Acronis backup image of the operating system partition, and manually copy/pasting my 4 terabytes of data to separate external hard drives via an ESATA dock. I backup the backup every year or so, so always have 2 reliable images in case of emergency. It takes roughly 20 minutes to reload an image versus months to get everything reinstalled and setup the way I like it manually (format – reinstall Windows). So yes, the terminology is important to understand in order to find what works best for you. What bothers me is that having been a loyal Acronis fan for a long time, I pay for new versions of True Image only to find out that the images created on older versions will no longer work. Still, Acronis is all most home users will ever need. I recommend buying 1 version and sticking with it. That makes it a 1 off fee. There is no shortage on information available through your favorite search engine about backup systems. Take some time and read. With external drives so affordable now, there’s no excuse not to have a decent backup system. I use acronis TI home on both my XP and Win7 pro systems on a monthly basis and whenever I am about to install new programs. I also have an extra internal “scratch” HD that I use to boot the system with (after removing the sata cable from the main HD). After boot-up I then restore the image back to the scratch drive as an insurance that the image restore will actually work. I find this restore step better insurance than just trusting the validation of the image. It is also good to keep the restore steps fresh in the mind! I partition my drives so that it takes only about a half-hour to image the C-partition and the critical win7 partition. I use Handy Backup to make backups of my data using non-compression so as to keep the backup files and folders in their native format. This allows me to restore my data, (or burn to DVD, etc.) without having having to rely on the program’s restore option. I want to thank you, Leo, for your “annoying repetition”. I’ve read your newsletter for some time, and started backing up because of your reminders – it’s gotten me out of jams on several occasions. Emailing yourself a copy of your data is a good way to back up some files which are of a size allowed by the email service provider, but those are also on the cloud as much as with any commercial cloud server. I prefer DropBox (or any big name cloud storage) along with BoxCryptor or TrueCrypt to encrypt them. It handles larger files and the backup is automatic and instantaneous. Personal data on a 1 TB WD disk. I have several articles on the topic – search for “backup” here and you’ll get a LOT of results. Chengdu Yiwo is the Chinese company behind the EaseUS ToDo software. I Googled ” is Chengdu Yiwo safe and got to a site ” Emsisoft” which raised a few doubts. Chengdu Yiwo is a very reliable company, and their website is safe.